Database: Principles Programming Performance provides an introduction to the fundamental principles of database systems. 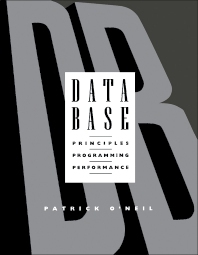 This book focuses on database programming and the relationships between principles, programming, and performance. Organized into 10 chapters, this book begins with an overview of database design principles and presents a comprehensive introduction to the concepts used by a DBA. This text then provides grounding in many abstract concepts of the relational model. Other chapters introduce SQL, describing its capabilities and covering the statements and functions of the programming language. This book provides as well an introduction to Embedded SQL and Dynamic SQL that is sufficiently detailed to enable students to immediately start writing database programs. The final chapter deals with some of the motivations for database systems spanning multiple CPUs, including client-server and distributed transactions. This book is a valuable resource for database administrators, application programmers, specialist users, and end users. Unlimited Slot Occupancy: How Many Slots are Occupied? Patrick O'Neil is a professor of computer science at the University of Massachusetts at Boston. He is responsible for a number of important research results in transactional performance and disk access algorithms, and he holds patents for his work in these and other database areas. Author of "The Set Query Benchmark" (in The Benchmark Handbook for Database and Transaction Processing Systems, also from Morgan Kaufmann) and an area editor for Information Systems, O'Neil is also an active industry consultant who has worked with a number of prominent companies, including Microsoft, Oracle, Sybase, Informix, Praxis, Price Waterhouse, and Policy Management Systems Corporation.